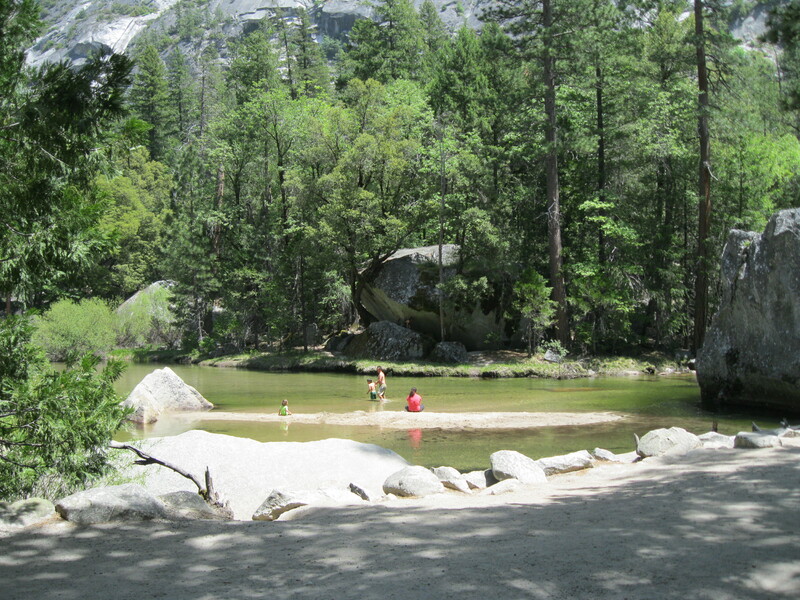 The southern portion of the loop trail around Mirror Lake in Yosemite National Park recently opened after a 3 ½ year closure due to the Ahwihya Point rock fall. In March 2009, rocks near Half Dome fell approximately 1,800 feet with an impact equivalent to a magnitude 2.4 earthquake. Having walked only the northern portion of the trail to Mirror Lake, I was anxious to experience the newly constructed path on the opposite side. 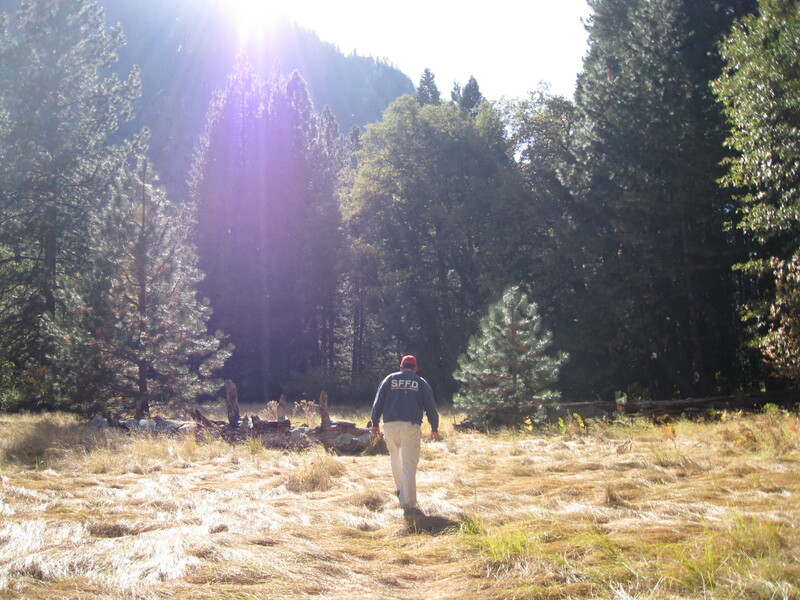 So Chris and I headed to Yosemite for a walk in the park. 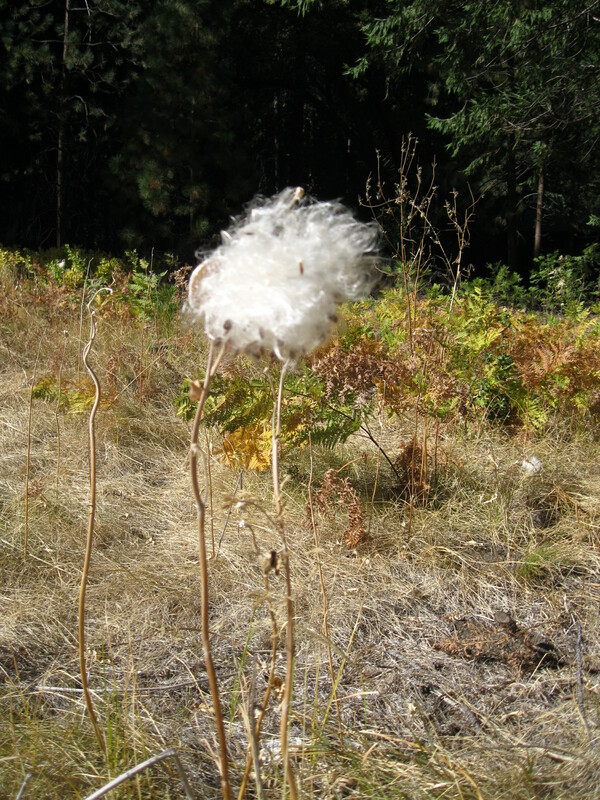 We parked near Ahwahnee Meadow where we walked in the warm sun through the soft dormant grass-land dotted with tall milkweed. 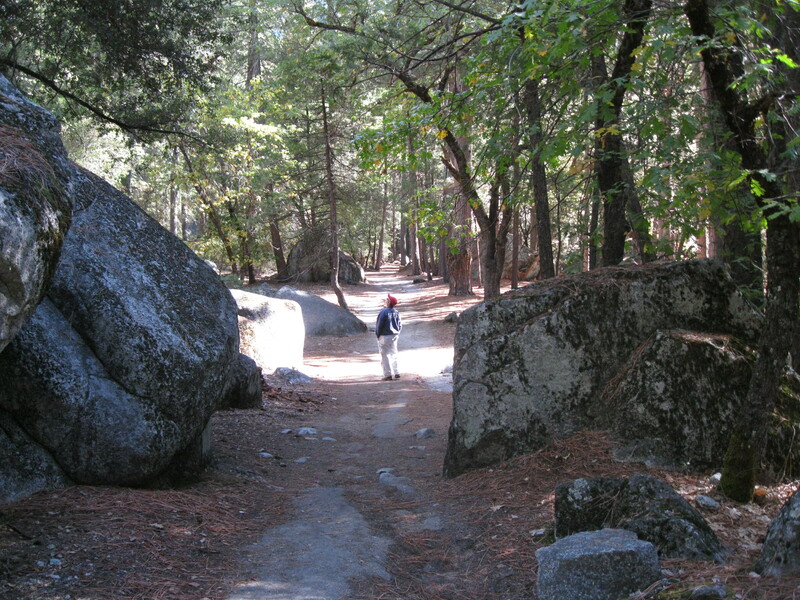 We walked in the cool shade through the boulder-strew forest where we watched rock climbers test their ability as they climbed up the granite monoliths. We walked on the paved bicycle path under a canopy of colorful trees; then uphill bordering Tenaya Creek. The lack of water in the creek was an indication of what was to come. Walking on the bike path/service road. 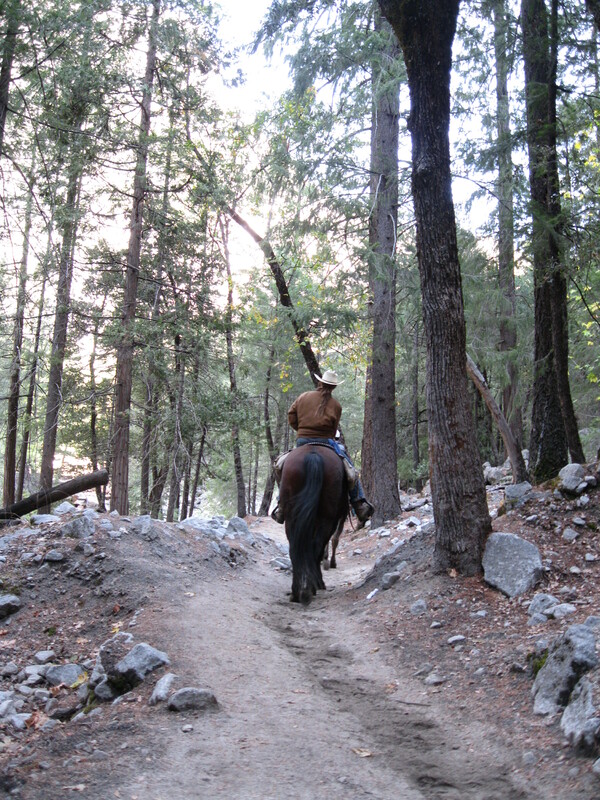 We stepped aside as a pack of mules moseyed on up the damp path, their riders happy to be trying out the recently re-opened trail without the burden of the uphill hike. Happy trails to the horse bringing up the rear of the pack. We reached the lake at the base of Half Dome but Chris didn’t realize we were there until he began reading the information panels. (I failed to mention to him that the word “lake” in this case was a misnomer.) During spring and early summer, Mirror Lake is more like a pond. Spring at Mirror Lake, May 21, 2012. But towards the end of summer and throughout autumn, the lake is nothing more than an arid sand pit awaiting winter’s deluge. Mirror Lake without water, October 27, 2012. 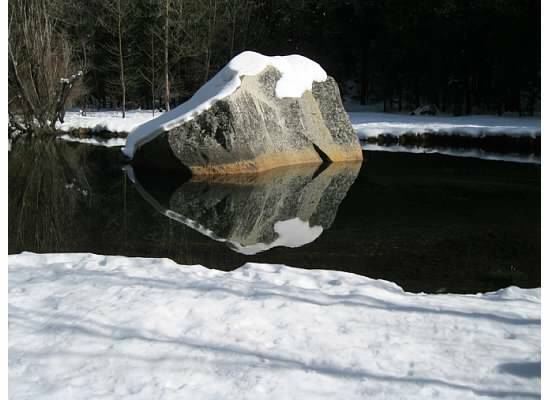 Winter at Mirror Lake, January 11, 2011. The water reflects the surrounding rocks and even Half Dome from certain areas. Even though we didn’t walk to the Ahwihya Point rockfall area, Chris and I enjoyed the afternoon walk in the park. We ended the day at the Ahwahnee Hotel for drinks and a late lunch. 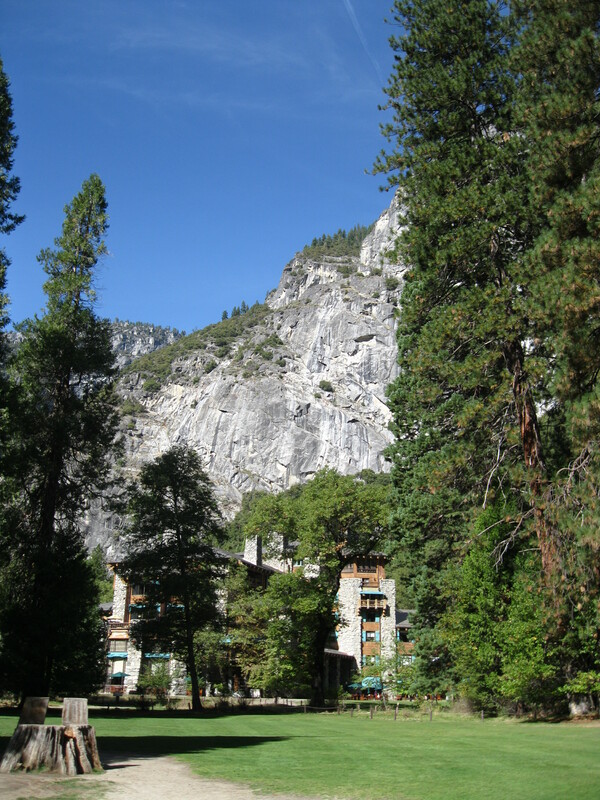 Approaching the back of the Ahwahnee Hotel. 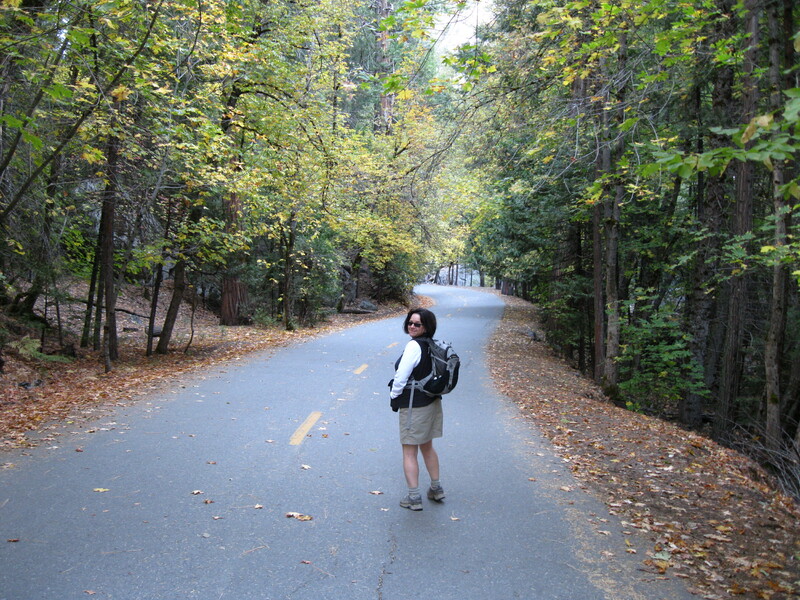 This entry was posted in Yosemite Hikes and tagged Hiking, Mirror Lake, Yosemite on October 28, 2012 by Janet. Beautiful pictures! I love how you showed the lake at all seasons! Sounds like a nice afternoon outing. As always, GREAT pictures. Thanks Dad. We were looking for places to take you when you come up here. 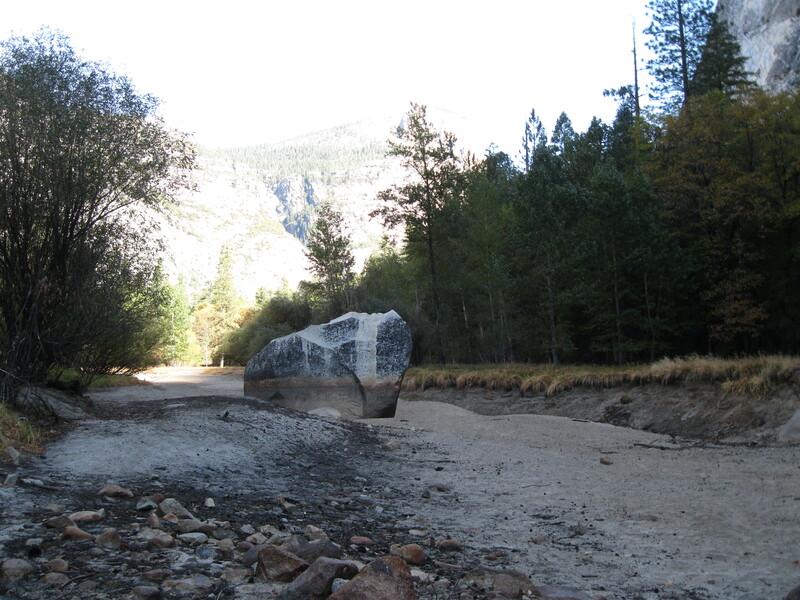 Hard to not be disturbed at the dramatic lack of water in Yosemite. Very scary. Your comparison pics especially reinforces just how frightening. Somehow I thought you had not been posting here because I was not getting email notifications. I fixed that and added you to my site for others to reference. Boy, was a wrong! You have been a very busy girl. Yes, the water everywhere is so low. We need snow! 🙂 Glad you’ll be getting the posts now. Awesome photos, as usual 🙂 Thanks for sharing!